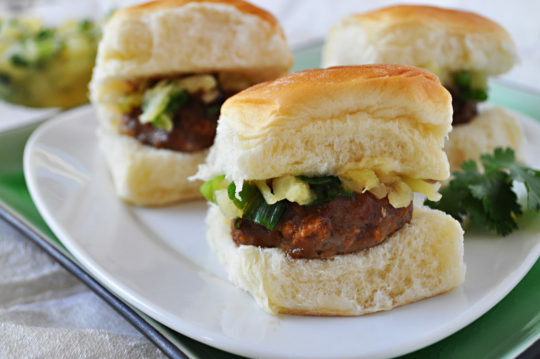 Outrageously, out of this world burgers bursting with Asian flavors, topped with pineapple salsa and served in miniature buns to make the ultimate pick-up. This recipe is from Holly Clegg’s trim&TERRIFIC® Too Hot in the Kitchen. Perfect blend of flavors to complement burgers, fish or chicken. Make ahead and refrigerate. This salsa makes a huge splash at a party! Preheat oven 450°F. Line baking pan with foil. In large bowl, combine all ingredients except rolls using 4 tablespoons hoisin sauce. Form into miniature patties (heaping tablespoons depending on size of bun) and place on prepared pan. Brush tops of burgers with remaining 2 tablespoons hoisin sauce. Bake 10-12 minutes or until done. Slit rolls and place burger with about a tablespoon Pineapple Salsa (see recipe). In bowl, mix together all ingredients. Refrigerate. Terrific Tip: Can make burgers earlier in the day, refrigerate, and cook when ready to serve. Recipe from Holly Clegg’s trim&TERRIFIC® Too Hot in the Kitchen. For more of Holly's easy healthy recipes, visit her Blog and YouTube channel.